Rashid Khan was named the 'Man of the Match' in both legs - home and away - against Mumbai Indians in 2018 for his figures of 4-0-13-1 & 4-1-11-2 respectively. While the star leg-spinner has taken three wickets in four matches this season at an economy rate under 6, his fellow countryman Mohammad Nabi has outshone Rashid in both the matches they've played together. Apart from the Afghan spin-twins, there's another - perhaps more dangerous - duo that Mumbai will have to deal with. In an Ashes year, it's an Aussie-English pair that's ruling the roost in the Indian Premier League.Four outings together, Jonny Bairstow and David Warner have stitched three century partnerships and one half-ton stand batting at the top of the order. They have amassed 510 runs, which turns out to be 68.5% of the team's total runs. Add a couple of cameos from Vijay Shankar to it, and you are staring at a formidable top-three. While the middle order has hardly been tested, their stronger suit over the years - bowling - has taken a beating in the death overs. Bhuvneshwar Kumar - the leader of the three-Indian-men pace-attack - went wicketless in the first three matches (0/37, 0/55, 0/25) and it required a sluggish Kotla track for him to return with decent figures. An in-form Bhuvneshwar would be the perfect recipe for SRH who play four of their next five matches at home. Mumbai Indians, who are often associated with the name 'slow-starters', have won two and lost two. The three-time IPL champions ticked quite a few boxes in their encounter against the defending champions - Chennai Super Kings. Despite a mediocre start, Suryakumar's half-century set the platform for the final flourish from the power-hitters. Debutant Jason Behrendorff shone with the new ball and the other bowlers backed up as Mumbai became the first side to register 100 IPL wins. Bairstow and Warner might be grabbing the headlines, but Mumbai's Hardik Pandya is making all the right noises. The all-rounder bagged a duck in the season-opener, however he's come back strongly with three cameos in as many games - 32(14), 31(19) and 25(8). He also played a big role as a bowler against CSK by picking three wickets for 20 runs in 4 overs. What to expect: Uppal, which has already witnessed three centuries in two games, is expected to host another high-scoring affair despite the bigger size of the ground. There's no forecast for rain and the temperatures will be around 30 degrees Celsius. Sunrisers Hyderabad: "If it ain't broke, don't fix it," is a popular adage. The Sunrisers, who have won three in a row, hardly broke a sweat in their last two matches having fielded the same team. It will be interesting to see if and when Williamson is fit, how the management slots him into the eleven. The opening duo of Warner and Bairstow are in red-hot form. Nabi, who replaced Williamson, has picked six wickets in two matches (economy rate: 4 and strike-rate: 5) and he showed his prowess with the bat as well against Delhi Capitals. And, their fourth overseas player - Rashid Khan is certainly undroppable. Mumbai Indians: Mumbai Indians will miss the services of Lasith Malinga (for the next three matches) who flew back to Sri Lanka immediately after the fixture against Chennai Super Kings to take part in the Super Provincial One Day Tournament - a domestic competition in Sri Lanka. Malinga took part in two matches in two different countries within a span of 24 hours and ended with a combined bowlings figures of 10/83. The veteran is expected to be replaced by Mitchell McClenaghan. The customary leg-spinner's spot will be a toss up between Rahul Chahar and Mayank Markande, depending on the latter's fitness. While Suryakumar Yadav and Krunal Pandya made significant contributions in their previous outing, Rohit would have been pleased with Pollard's performance. The Trinidadian, whose spot in the XI was under scanner, hit two massive sixes with the bat and also pulled off a screamer in the field to dismiss Suresh Raina. for how long SRH can bench Saha/Guppy and Likes of Williamson /Stanlake? 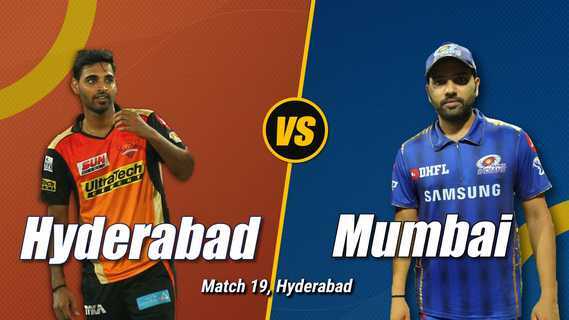 easy win for Hyderabad if Mumbai bats 1st or last. jayant Yadav in MI team but Pollard keep selected. i think yuvi should left out too in favour of Ishan kishan / sidesh Lad or Elegant Jaiswal. It rained in other parts of Hyderabad. No sight of rain here at the moment though. SRH are favorites in this match and the tournament right now. Good to see Ishan back in the team. I've got Hardik, Krunal, Suryakumar, Nabi, Rashid, Bairstow and Warner for my Fantasy team. Can't wait for the action! I've got Hardik, Krunal, Suryakumar,﻿ Nabi, Rashid, Bairstow and Warner for my Fantasy team. Never thought I'd see the words in bold ever used in the same sentence. IPL should just have the forfeit/resign option. Just like chess. Then they can show ads for 4 hours. Wth yousuf and Pandey still in? Murali karthik oh my "women have better eyes, better ears"
Rohit is in such awful form. Looks like a slower wicket. This Kaul guy is such an eyesore. Can't believe he played for India. Useless in all departments. yea. Probably SRH will regret for that drop. That was a huge 6. And quite random.